On December 22, 1901, history was created in Indian education when Rabindranath Tagore inaugurated his school in Shantiniketan. Various aspects of education and learning were churning his mind all along ever since he, as a child, experienced what went on in the schools. Gradually, he evolved his own perception of the process of acquisition of knowledge and started planning to give it a practical shape. He started by teaching his own children but realised that sporadic initiatives would not work. As Tagore’s biographer, Krishna Kripalani, put it: “Having suffered from bad teaching in his childhood, Tagore had thought much, and written, too, on the fundamentals of teaching, and now, he gained a new insight by putting his principles into practice. But teaching one’s children haphazardly is not enough. He needed a wider field for systematic experimentation. He thought, why not shift to Shantiniketan and start a small experimental school there?” His thought process was already influenced by the ancient gurukula system and the way knowledge was dispensed and acquired there, naturally. Sages and saints lived with their pupils, presented the ideals of simple living and universal thinking. Tagore was convinced that the best teacher was nature. He wanted to recreate the joyful, soulful and inspiring environment of Tapovan that could add grace and beauty to the entire process of learning, internalising knowledge and acquiring skills to utilise it for the welfare of the people. Revival and inclusion of the basics of ancient Indian system were the only way out of the soulless and mechanical system that had replaced it. 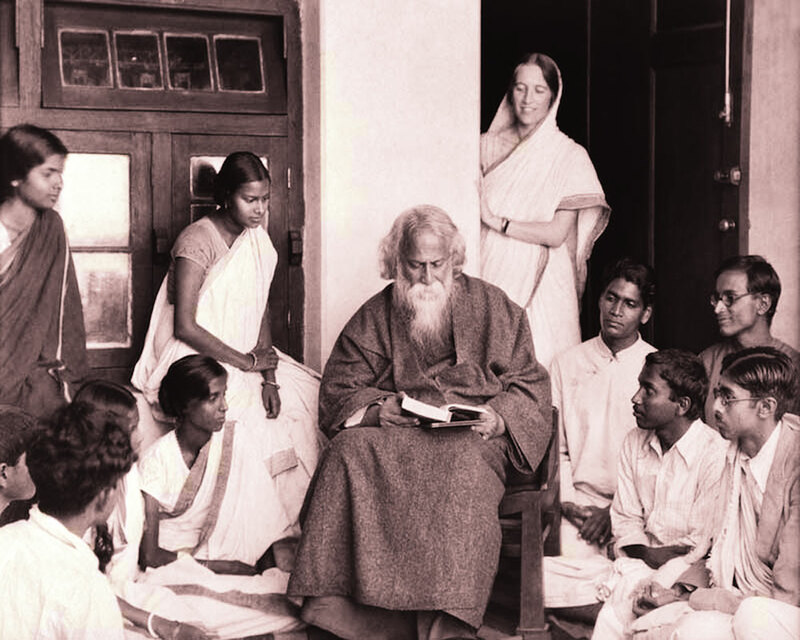 All that he experienced and disliked, fired the imagination of young Tagore to visualise better ways to educate. And this thought process that began rather early and resulted in the creation of the persona of the gurudev. His search for a universal humane approach to the existing system of imparting and receiving education, knowledge and wisdom was a lifelong process. As the scion of a zamindar family, with a very sensitive and compassionate mind, his life-long passion was not only education, culture and art, but also the economic rehabilitation of the Indian village. His consistent and lifelong interest was the welfare of Indian peasants. Simultaneously, the sensitive poet was keenly observing the people of India, their miseries, strengths, selfishness, readiness to sacrifice, patience, heroism and sense of resignation to fate and in the process accepting injustice without manly retaliation. Tagore understood India — its people and its tradition of knowledge quest — its contemporary relevance and deficiencies that grew due to the lack of dynamisms and reluctance to move with current times. While his outstanding contributions in the intellectual arena are recognised and revered throughout India and abroad, his singular and sensitivity-filled initiatives for the masses are often overshadowed. Not many know that he had, along with Shantiniketan, also founded a parallel institution — Sriniketan — for the welfare of the peasants. These farm labourers needed support, including inputs of new ideas, skills and outputs of new experiments and innovations that were feasible because of developments in science and technology. He donated a part of the Nobel Prize amount to his school in Shantiniketan and invested a substantial portion in a cooperative bank that was created by him to help needy peasants on his family estate. He realised that people needed to be inspired about their inner potential and ways to manifest it, moving out of the shackles of despondency and rejuvenate their lives through regeneration of self-assurance and acquisition of requisite levels of knowledge and skills. Once the cloud of darkness is dispersed through the light of the right kind of education, given and received in a congenial and sensitive environment, it would be easy to comprehend the ‘unity of truth.’ This is one aspect that has been creating so much turmoil in human existence at this stage. It manifests in the shape of war, violence, distrust, fundamentalism, insecurity, misery, hunger and poverty. It is evident that Tagore liked every learner to be well aware of his/her responsibility to strengthen the sensitive bond between man and nature. And that would be possible and practical only when human beings learn to respect each other, realise the unity in diversity, appreciate the beauty of multiplicity of every conceivable variety, including the religious plurarism. Familiarity with the basics of Tagore’s philosophy of education can go a long way in re-orienting the present system that is causing much concern to every thinking mind. Inadequacies in personality development, internalisation of values of social cohesion and religious amity, human responsibility in maintaining sensitive human-nature relationship are now appearing before us in frightening proportions. The system Tagore envisioned is universally applicable. It could also be interpreted as a total acceptance of Vasudhaiva Kutumbakam in pragmatic terms. It’s time India reconsiders the basics of its education policy and systemic structures on this count: Is it nurturing the power of ideas and imagination among the learners, or stunting them? It’s time to consider how curiosity and creativity is encouraged and inspired to flourish without any shackles. It has an organic link to the process of growth and development of the country and its people.